This intermediate Kit combines the aromas presented in the Red Wine and the White Wine Kit. These 24 aromas/reference molecules are directly linked to the molecular composition of red and white wine (including Champagne). They enable the 24 most common aromas found in red and White wine to be memorised and identified. Memorising these aromas provides an accurate and coherent vocabulary to further stimulate our appreciation of fine wines. 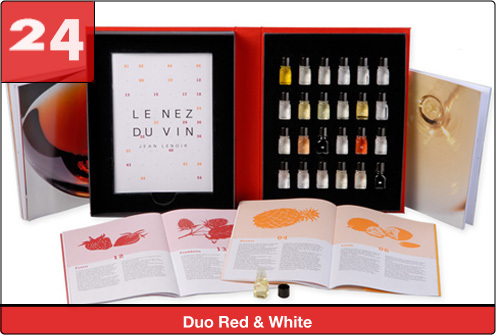 Two beautifully illustrated manuals accompany the kit covering the Le Nez du Vin instruction method, as well as a detailed description of each aroma, its corresponding molecule and a listing of wines in which they can be found.